World Record Towing a Caravan Jump shown on the Fifth Gear TV Show. Wow, what a way to destroy a caravan with style, in order to hold a world record. For those interested, the previous Longest Caravan Jump Record, was held by Australian Ray Baumann, measured at 157 feet 6 inches to where the tow vehicles front wheels first touched down. The New World Record. is held by an English Stuntman Derek Lee, at 187 feet 8 inches using a BMW as the tow vehicle. 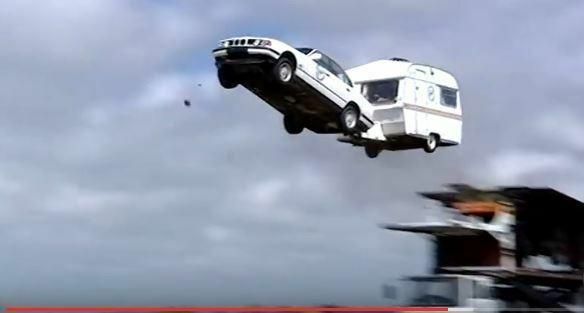 This video below by Fifth Gear, shows just how crazy some Caravan Drivers really are. haha. Now the Big Question is, who will be mad enough to try and create a new world record, for the longest caravan jump in history. Not Me that's for sure.